In today’s health-conscious society, it’s important to watch out for fad diets that don’t work. Veganism is a lifestyle that’s more than just a passing fad. A vegan diet is centered around avoiding eating animals and products derived from animals, such as dairy, eggs, and meat. Where do vegans get their protein? Here is our guide to a protein-based vegan diet. After cutting animal-derived products from your diet, you have more room to eat fruits and vegetables. According to the Center for Disease Control, only 1 in 10 adults get enough fruits and vegetables. Fruits and vegetables contain nutrients and vitamins essential for prime health. Not eating animals and their derivatives reduce saturated fat and cholesterol intake. A vegan diet boosts HDL, good cholesterol, and lowers LDL, the bad cholesterol. A reduction in bad cholesterol reduces the risk of heart disease. Vegans benefit from lower blood sugar levels and improved kidney functions. A study by the American Diabetes Association shows vegan diets lower blood sugar levels in people with diabetes more than any other diet. Similar studies focusing on diabetes show substituting meat for plant protein reduces the risk of kidney disease. You don’t have to take his word for it, as his improved performance is seen in the Celtics’ 110-107 win over the Atlanta Hawks. The 25-year-old basketball superstar reported he doesn’t plan on abandoning his vegan lifestyle anytime soon. Kyrie Irving promoted his vegan lifestyle in his recent Nike advertisement. PCN Pro-tip: begin your morning with a quick protein breakfast recipe. Instead of focusing on the things vegans can’t eat, focus on all the delicious vegan foods and their benefits to your health. A vegan diet helps your overall health and energy levels for prime athletic performance. 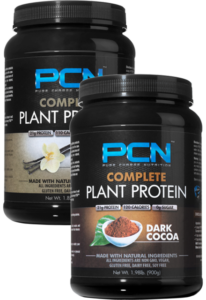 Learn more about fueling your workouts with plant-based protein.